JVisualVM adds extra information to the basic JMX client functionality via a separate plugin called “VisualGC”. 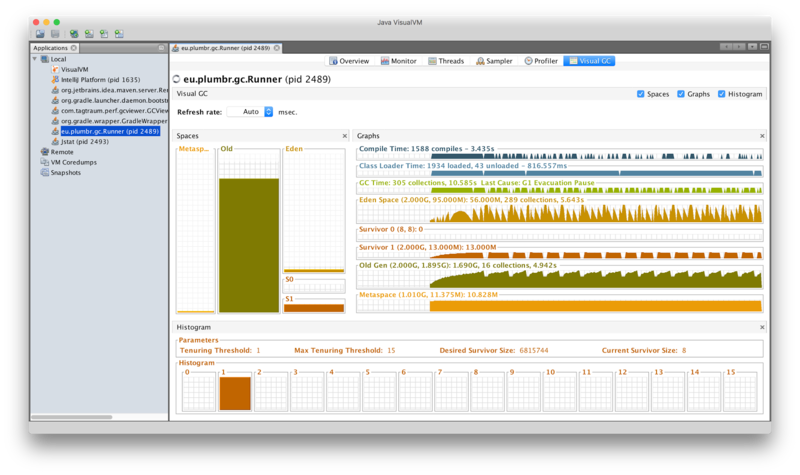 It provides a real-time view into GC events and the occupancy of different memory regions inside JVM. The most common use-case for the Visual GC plugin is the monitoring of the locally running application, when an application developer or a performance specialist wants an easy way to get visual information about the general behavior of the GC during a test run of the application. On the left side of the charts you can see the real-time view of the current usages of the different memory pools: Metaspace or Permanent Generation, Old Generation, Eden Generation and two Survivor Spaces. On the right side, top two charts are not GC related, exposing JIT compilation times and class loading timings. The following six charts display the history of the memory pools usages, the number of GC collections of each pool and cumulative time of GC for that pool. In addition for each pool its current size, peak usage and maximum size are displayed. Below is the distribution of objects ages that currently reside in the Young generation. The full discussion of objects tenuring monitoring is outside of the scope of this chapter. When compared with pure JMX tools, the VisualGC add-on to JVisualVM does offer slightly better insight to the JVM, so when you have only these two tools in your toolkit, pick the VisualGC plug-in. If you can use any other solutions referred to in this chapter, read on. Alternative options can give you more information and better insight. There is however a particular use-case discussed in the “Profilers” section where JVisualVM is suitable for – namely allocation profiling, so by no means we are demoting the tool in general, just for the particular use case.